When things go wrong, like they did this season, the cost of doing business may become too high. However, University of Florida / Institute of Food and Agricultural Sciences (UF/IFAS) researchers are working to change that. Through research on a blueberry relative, the sparkleberry, they hope to be able to produce new blueberries that require little or no pine bark—and can be mechanically harvested. “We’re interested in it because it grows as a tree,” explains Dr. Rebecca Darnell, a plant physiologist at UF in Gainesville. 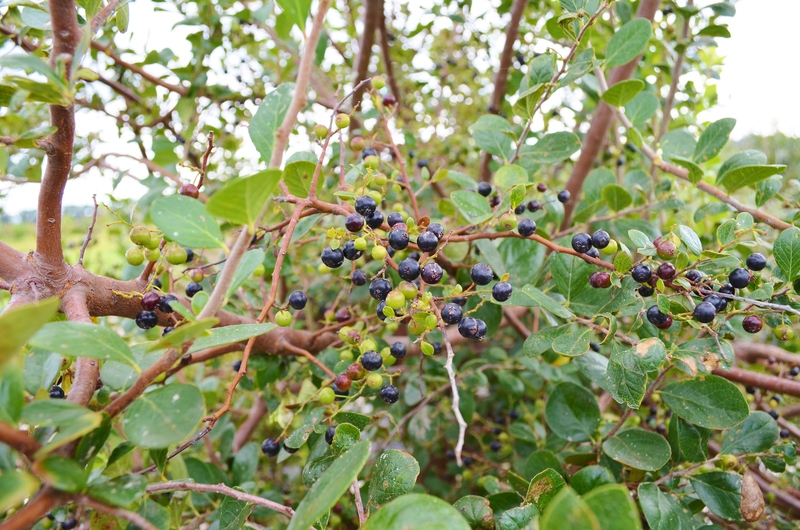 Sparkleberry, a wild relative of the edible blueberry, can grow in pure sand. Native to the southeastern United States, the sparkleberry has a wide and deep root system, making it more drought tolerant. The berry is smaller, darker in color, seedy and gritty, and not very appealing to eat. It also has less natural, outer wax. What is particularly attractive, however, is that the plant has a trunk, making it suitable for the harvesting machine. Cultivated blueberries are multi-caned, so catcher plates on the harvester can’t close. “There’s a lot of fruit that’s lost” in mechanically harvested blueberry plants, Dr. Darnell explains. However, researchers aim to change all that by breeding sparkleberry with other blueberry varieties currently in the field. Trial plantings have only been in the ground for three years at Citra and Archer. The hope is that they will grow in soils not ideal for blueberries, with less organic matter, Dr. Darnell reports. “Our research is fairly new, with a couple years of evaluation of the rootstocks. There are some encouraging results,” adds Bruno Casamali, a master’s candidate at UF’s Horticulture Sciences Department who works with grafting/rootstocks experiments. Blueberries prefer an acidic soil, while sparkleberries will tolerate a higher soil ph, according to Dr. Jeff Williamson, an extension specialist for blueberries at the University of Florida/Institute of Food and Agricultural Sciences (UF/IFAS) in Gainsville. A simulated testing on half of the crop at Archer showed grafted plants had 40 percent fewer ground loss than those on their own rootstocks. But it will likely take about five years to know how grafted trees will perform, researchers say. “The only way to do it is to observe them over time and see how they do in a commercial field,” Dr. Williamson explains. While researchers don’t really know how the sparkleberry rootstock will affect fruit quality, it is not expected to have any significant impact. “We don’t have a reason to believe it’s going to drastically change the characteristics of the fruit of a given cultivar,” Dr. Williamson says. Meanwhile, the UF breeding program also is looking at sparkleberry. “We’re trying to bring those traits in that we would want in,” states Dr. Jim Olmstead, who operates from UF’s blueberry breeding program. On the surface, it appears to be a lot cheaper to run a mechanical harvester through the berry fields. Dudley Calfee, president of the Florida Blueberry Growers Association, estimates it costs 25 to 30 cents per pound to machine harvest, compared to an estimated 85 cents to $1.10 per pound for hand picking. But the critical difference is in the cull rate—how many berries make it through quality control after machine harvesting. “You can toss around a lot of numbers. It depends on your individual deal,” Calfee asserts. “The industry in Florida is a hand harvested industry. That’s its history and where it still is,” Dr. Williamson adds. If researchers have their way, however, time will prove to bring about a plant that brings more fruitful results when mechanically harvested with the help of sparkleberry.